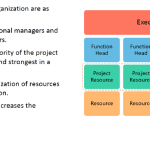 In a functional organization, the resources of the organization are grouped by “functions” – sometimes called departments. Examples of functions could be “sales”, “finance”, “administration”, “manufacturing”, etc. Each function plays a definite role in the organization and is headed by a functional head or supervisor. All the resources in such an organization report directly into their functions. Therefore, a sales person would report into the sales organizational hierarchy, a purchase executive would report into procurement, and so on. 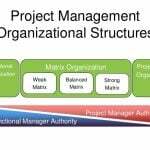 You would notice that in a functional organization, the project manager’s role is not explicitly called out. When a functional organization embarks on a project, each of the functions that are involved may volunteer some resources to work on the project. One of these resources may end up playing the project manager’s role. The resource assignments may not even be full time and sometimes even the project manager is part time. 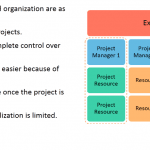 Since the project manager has no authority over any of the resources, they are dependent on the functional heads. This makes it more challenging for the project managers to coordinate in the team. 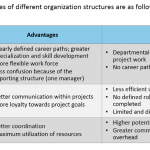 However, functional organizations provide an opportunity for specialization. For example, if a purchase executive was reporting into the purchase department, that executive would have exposure to all the purchasing that happens within the organization and has a well-defined career path. In functional organizations, project management happens at the Functional Head level.